Flower-like leaves, with lots of flowers too. 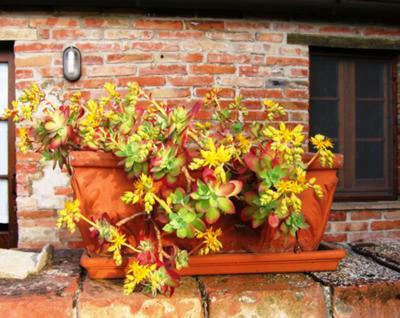 This appears to be some type of Echeveria, based on the form of the leaves, but most have either pink or peach coloured blooms, not bright yellow. A close up of the flower to show the form would be a help, as that's where many identifying features are - the form of each flower, and how many stamens, how many petals and how they are attached and arranged on the stem. I have to say, this plant looks happy, so obviously it's getting enough light. Sorry I can't tell you more, but maybe that will narrow it down a little. I too have yellow flowers on what I think is an echeveria - off of a shoot that hangs down. Wondering though if I should trim the flowers when they die and also the shoot??? Hi Lydia, yes, by all means trim the dead flower stalk right off at the base. The plant doesn't need it any more once the flowers shrivel.